Tourmaline, along with Opal is the October birthstone. It is also the 8th-year anniversary gift in many parts of the world. Tourmaline is a semi-precious stone made of a crystalline boron silicate mineral compounded with elements such as aluminum, iron, magnesium, sodium, lithium, or potassium. It is naturally occurring in parts of North America, Afghanistan, Thailand, Russia, Nigeria, Eastern Africa, as well Botswana and Madagascar, with the largest quantity of fine, richly-colored tourmalines being found in the state of Minas Gerais in south central Brazil. Tourmalines range in color from purple to black, pale peaches to dark browns, pinks and reds to greens, and even rarer, when naturally occurring with copper they will take on a much sought-after blue-green that is very vibrant and referred to as a Paraiba Tourmaline, named so after the waters of the coastal city in Brazil. The word Tourmaline comes from the Sinhalese word තෝරමල්ලි, simply referring to precious stones in Sri Lanka. It was later adopted by the French and Dutch to specifically describe this family in gemology. Tourmalines have been used in jewelry for millennia, and were confused with corundum and beryls until defined by the Portuguese and Spanish explorers who found the stones in Brazil during the mid-1500’s. These were first confused with emerald, which is why, still to this day, many designers working with tourmaline will refer to it as “Brazilian Emerald,” despite the fact that they come in such an array of colors. Tourmalines were not only found in Brazil, however. 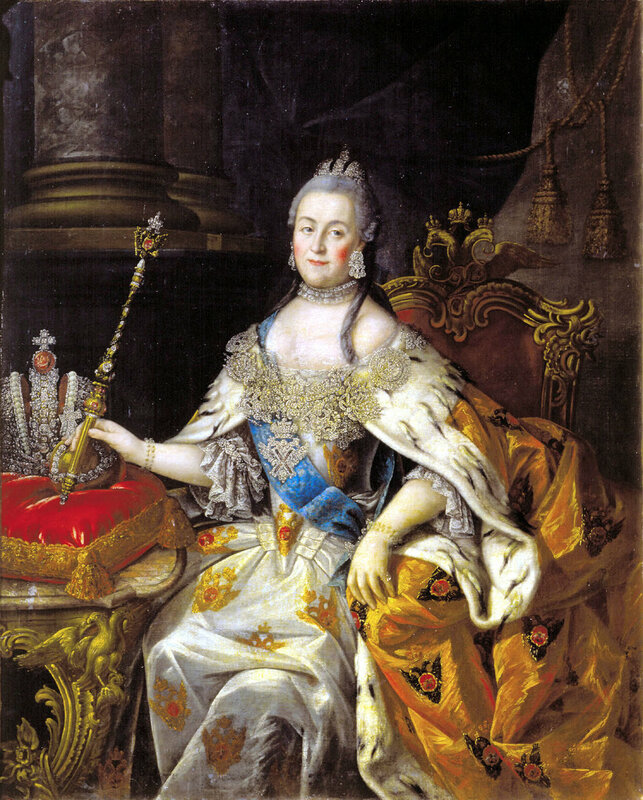 As mentioned above, tourmalines also have been found in Russia, and during the reign of Catherine II, King Gustav III of Sweden gifted to Catherine "Caesar's Ruby” during a state visit. This was, in actuality, not a ruby at all but rather a 52 carat rubellite tourmaline in the shape of a cluster of grapes, topped with enameled gold leaves and vine-shaped bail. “Caesar’s Ruby” c. 1745 a 52 ct. rubellite tourmaline, with enameled 18 karat gold leaves and silver bail. Tourmaline is also found in North America, particularly in deposits found in California as well as Maine. In 1975 the Maine Retail Jewelers Association presented the governor with a 10” long deep green tourmaline referred to as the “Jolly Green Giant,” which now lives in the permanent collection of the Smithsonian National Museum of Natural and Science in Washington D. C.
R4255, 18 karat yellow gold mounting with platinum shoulders, rose-cut diamonds and a carved tourmaline, Art Deco, circa 1920s with French hallmarks. The Art Deco movement was an amazing time for jewelry. It not only was a time of amazing innovation and design changes, but also influenced more movements that followed, more than any other in my opinion. The ring pictured below is a great example of the Deco solitaire, which wasn't as common as the filigree work you might see in other parts of our website. This mounting was so distinctive, that when it came through the store, without a center stone, we decided to find something that would set it off, adding color, life and to make the piece just a little more feminine with the addition of this gorgeous, 1.93 carat pink tourmaline. R3854, a platinum mounting, set with 0.25 carats of round and baguette-cut diamonds, and a 1.93 carat pink tourmaline center. Art Deco, circa 1930s. During the 1950's the American economy took a look upwards towards the ready-made movement. Companies grew, mass production of food-stuffs took hold because of the ecology and practices of the agricultural industries, and because of these industries many others followed, advertising, branding, housing and trade markets boomed and many people made so much money in such a short amount of time that they wanted to flaunt it! Luxury was the name of the game. This was what we refer to as the "Retro era," lasting from the 1950s - the 1970s, with signature styles like that of Elizabeth Taylor, Grace Kelly, Marilyn Monroe, to the 70's big polyester bell bottoms, and empowering of the women rights movement. From big dresses, filled with layers of to tulle; glamorous, beaded gowns; baroque fabrics with bright synthetic fibers; and loud, flowing colors; all dotting the American fashion trends with much more modern and simple silhouettes, and minimal, effortless styles. Along with all the flaunt of the fashions, jewelry too changed. Both costume and finely made necklaces were big, to match the hair. Enormous clip-on earrings in either gold or brass were intended to draw attention. Rings were no exception. The elongated dinner rings of the 20's were no more. Cocktail rings took over, and huge stones that sat up off of the finger became the norm. If you were anyone, you had a cocktail ring that represented your value in fashion. Below is an example of such a ring. This ring is from the 1970's in 14 karat yellow gold, with a 14.5 carat, deep green tourmaline, surrounded by over a carat of round brilliant diamonds. It is not only beautiful to look at, but it is the type of piece that declares one's value. MSP43, 14 karat yellow gold mounting, set with a 14.5 carat green tourmaline, surrounded by 1.05 carats of diamonds. Retro, circa 1970. In folklore and ritual, Tourmalines are said to keep things youthful and fresh, from one's complexion to one's marriage, and specifically one's sexuality. The stone is a protector and cleanser for the endocrine, and lymphatic systems as well as grounding for the hormonal waves that we all go through. It is because of this that many people regard tourmalines as a great stone to wear when feelings of insecurity or self esteem issues might arise. This gives the wearer power to participate more fully in her own creation of life, art, and self view as well as give a greater peace of mind.